USSA’s are finally happening and teams are ready to play ball. 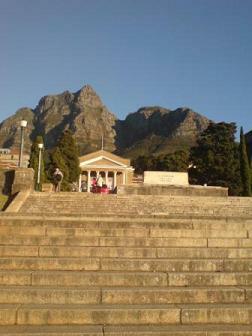 Teams started arriving in the late afternoons, to get room allocations and settle in to their rooms at the University of Cape Town (UCT). Yesterday was the first day of tournament and all the teams were ready to represent. The morning games were scheduled and The University of Limpopo was scheduled to play Rhodes University (Ladies). This was Rhodes first USSA tournament and they got of on a good note during the first half of the game. With Limpopo not having the same team they had at last years USSA, you would think they would have trouble wining against Rhodes. The game was pretty competitive, but the lack of experience Rhodes had got the better of them allowing Limpopo to dominate the game and winning their first game of the tournament. On the other side of the court the host team UCT linked up with Rhodes University and what a game that was.UCT wanted to show the crowd that the can hold it down on their home turf, which they did for about 3 quarters. Having forwards playing like guards, you would think that UCT would dominate the court and prove a point; unfortunately they fell short allowing Rhodes to take the game putting points up on the standings table. After lunch the bigger, more competitive games started taking place, were from the ladies side of the court big competitors TUKS played their second game of the day against UJ. The game was one of the most heated games of the day were both teams held their own. This game was more of a mental game than anything and with “Miss Shorty like mine” Requelh running the point for TUKS, which was sure to have a very positive impact on the team. Lungile Motsweni was holding it down offensively for UJ; hitting 2 3pointers in a row putting up the score for UJ. At the end that was not enough to stop TUKS from winning. Good game by Takalane Mfamadi who was 4for3 by the line and 8 from the field. It was a game of David vs. Goliath when TUKS men went up against the University of Johannesburg. 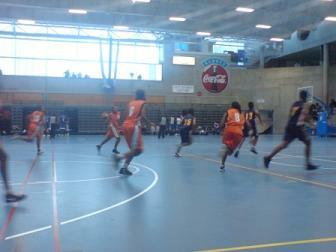 The game started at a quick pace with the UJ point guard pushing the ball on the floor and TUKS playing catch up. TUKS played a 3-1-1 zone which only opened the flood gates for the shooting of Lucky Loate and the inside presence of Thabo Letsebe. At the end of the first quarter UJ was up 09-24 and then in most minds the game set done. TUKS was kept in the game the hustle mentality of number 4, Junior, OT that was not enough as he got into foul trouble and the inclusion Mathew, aka Big Baby, did not help matters as the UJ defence stifled the movement inside. By the end of the 2nd quarter UJ were up 54-17 and by then the game was beyond reasonable doubt. In the 3rd quarter UP went on the hunt when they picked up UJ man to man defence and with the inclusion of Oteng Phirinyane who took the fight to the UJ players and started making things happen. In the fourth quarter UJ were restricted to 18 points and UP got 15 points for their troubles. This group might prove interesting as the fight for second place is on and UP, UKZN and UWC are all gunning for the spot after UJ. 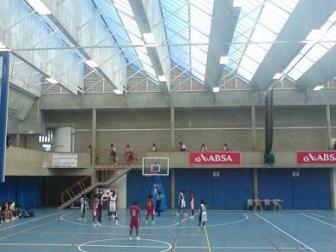 The USSA champions VUT were up against the hosts UCT. UCT started like a house on fire but could not convert their easy shots and VUT had their hands with their own unforced turnovers.VUT went to their tried and tested 1 on 1 full court press and it seemed to hurry their opponents into bad and low percentage shots. On the offensive end VUT also turned the ball over cheaply and that made the coach go crazy having to call a time out in the first three minutes. At the end of the first quarter VUT only commanded a slight 6 point lead. In the second quarter UCT turned the match into a one man offence when on 80% of the passion was spent in the hands of number 8. He had the crowd eating out of his shoes when he dazzled the VUT point guard Nhlanhla Dlamini. VUT went back to their drawing board and started getting Thabang Kgwedi and Kenneth Motaung into the thick of things, within two minutes the UCT forwards were in foul trouble and that allowed for the ball to kick out opened a it up for the shooters, Tshepo Matsie and Ayanda Shange. For people who have watched the VUT team over the past few years the game took a familiar pattern with VUT closing down the main scorers and running the floor like bunch of hyenas smelling a wounded beast. By this time the ball was getting too hot for the UCT players and every player was not prepared to bring the ball up the court. The officiating was put on the spotlight when the VUT no 4, Ayanda Shange, got two technical fouls but was allowed to continue playing let alone stay in the gym. 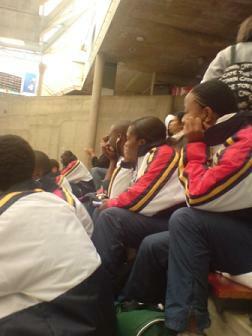 At the end VUT won the game but UCT gave them a run for their money. At the end of the day the the defensive intensity from the Vaal team took out all the steam from the UCT players. I seem to remenber someone saying that UJ ladies were going to win the tournament hands down…. Well sports has a funny of giving you unexpected results…. As long as TUKS and Vaal are in a tournament, never write off their chances..
hey,i also thought so..but am disappointed with the quality they have at their disposal..